Copywriters have always been the best content writers. selling knives on late night TV. People need to know, like, and trust before they'll do any business with you. "Content marketing means creating and sharing valuable free content to attract and convert prospects into customers, and customers into repeat buyers." The way to write for the web is to create and maintain relationships with those interested in your products and services. You have permission to offer your products and services after you show your target audience you understand their needs. Hire a web copywriter who knows how to help you make this happen. Mold your web content creation plan around the above concepts and begin to see a difference. A copywriter trained for the web is the perfect choice to help your bottom line. There's a misunderstanding that copywriting and copywriters are only associated with hard-core selling. As such, many well-meaning web content firms believe that the skills of a copywriter are wrong for the web, and they shouldn't be hired. The firms don't realize that copywriters trained for the web will deliver unparalleled results. Time-tested truths. And hiring a writer who isn't trained for writing on the web can be a mistake. 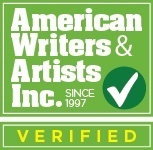 My training, and the training of hundreds of copywriters before and after me, is from AWAI, Inc. Their flagship copywriting course teaches the construction of the long-form sales letter. The art form of crafting a successful sales letter is the most sought-after skill in business today. Why? Because the results are measurable. These are the same successful elements of writing for the web. The differences are in the presentation. Copywriting techniques, by themselves ─ items such as persuasive writing, clarity, the use of the proper voice (character), conversational writing, and call-to-action ─ will certainly shape any form of content writing. Copywriters ARE content writers. We don't write about techniques! We use good copywriting skills to craft content about people. And products. And ideas. "Content without copywriting is a waste of good content." Brian Clark and Sonia Simone not only get it. They wrote the book on content marketing for the internet. Ben Franklin. No copywriter stood out more than any of his era. He understood persuasive writing. He was so persuasive, that he created the U.S. Postal Service. So his own newsletter would have quick delivery! Richard Viguerie. When Goldwater lost all but six states in '64, most thought the conservative movement was dead. But he went to the source list of the contributors to the Goldwater campaign and wrote their 12,000 names and info by hand. He sent those people thousands of letters. Those letters culminated in the nomination of Ronald Reagan for president in 1980. Morris Dees. While still in college, Morris started writing letters to the parents of his fellow students. In these letters, he offered to bake a cake and also deliver it to the kid on his birthday. By the time he graduated from law school, he was already a very wealthy man. He used that money, that degree, and those copywriting skills to open the Southern Poverty Law Center (a firm that fights racism by taking civil rights cases to court on behalf of poor African-American clients). Copywriters understand the power of words. We understand how that power can establish how folks know, like, and trust our clients. Copywriters can use their Big Ideas to help change the world. Before I get to the presentation differences, I need to give you two definitions. Advertising that has to interrupt what you're doing and capture your attention. Direct-response copywriters skilled in the art of the long-form sales letter know persuasive writing, and deep product / customer research. These are critical skills that are in use in every form of copywriting today. The long-form style is still in use today in the financial, health, self-help, fund raising, and speech writing segments. TV / Radio / magazine advertising is from Madison Avenue agencies. Their skills are in the art of persuasive visual, text, and branding communication. These are non-scientific types of advertising. There's no way to accurately measure response rates. And these methods cost more to produce because of that. The Furrow, by John Deere in 1895. He wrote to educate farmers on how to better manage crops. The Michelin Guide, by Michelin Tires in 1900. The 400-page guide wrote to folks on how to maintain their cars. And thus, use them more. In 1904, the Jell-O company was broke. They devised a plan for people to submit their favorite Jell-O recipes. Company sales grew to $1M by 1906, and the strategy is still used today. In the 1930's, Procter & Gamble ─ and other household cleaning product companies ─ sponsored daytime radio dramas. They were dubbed Soap Operas and eventually became TV dramas. Which continue until today. The internet was originally created as a place for communication, not for commerce. It was a place for forums and chat rooms. At first, companies didn't see the value in marketing on the internet. 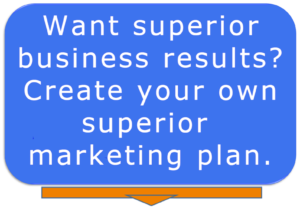 Business web pages and entire sites were never written by traditional marketers. Companies of all sizes created websites written by amateurs, journalists, and teachers. Anyone who could write. Many website companies recommended non-marketing writers. There were internet companies called content farms (they're still around, sadly). They hired inexpensive writers to create specific pages for companies, products, and ideas. These writers created page after page of irrelevant content. To try and get the search engines to rank the pages higher, they created pages stuffed with keywords. There was no regard for relevant content on pages to naturally attract the right audiences. Whether good-intentioned amateur writers, or writing from content farms. When companies finally started using advertising, they used interruption marketing techniques. And so many of them still do!! Interruption marketing isn't successful on the internet. The difference is in people's attitudes when they're online. For the times when we're kicking back and watching TV or reading a magazine, we have a passive mindset. Interruption marketing was designed to try and break through this passive mindset. When you and I are online, we're actively pursuing ideas and products. There's a different approach to market to the active mind. Interruption marketing on the internet is not welcomed by many. It's abrasive. Think how annoyed you get when you're searching for something specific. And suddenly you get this distracting pop-up. Or this video starts playing automatically. It's not what you're searching for. It's interrupting your valuable search time. Copywriters such as Rebecca Matter, the president of AWAI, Inc. and freelancer Nick Usborne recognized this problem of marketing to the active vs. passive mindset years ago. They're trained direct-response copywriters. They saw how persuasive writing could be adapted for the active internet searcher. These pioneers spearheaded massive training efforts to train direct-response copywriters in the ways of writing for the web. At the core, the direct-response persuasive writer is tightly focused on the reader. And the reader is a tightly focused target group. The writer has done massive research on the target group before writing a single word. The intention is to resonate and agree with the reader. The goal is to provide the perfect solution to the reader. At the core, this type of writing is perfect for the web. It's normal, everyday communication. Why is it normal? Because direct-response writing is all about telling stories. It's about including the reader in the conversation. The sales-y, hype language that is found in financial and other direct-response letters is never written when writing for the web (except for financial websites and newsletters, of course!). While that's welcomed in those circles, it's seen as Interruption Marketing for most of the web. For the majority of the web, conversational copywriting is what's called for. This is the art of coming alongside folks and helping them find what they need. Direct-response copywriting says that it's imperative for the reader to know, like, and trust before asking for the sale. Madison Avenue-type of interruption marketing can't adapt to our active and conversational mindset online. Direct-response copywriting can. It meets people where they are, in their comfort zone. Conversational copywriting works because this style is designed to resonate with the reader ... to continue the conversation that is already taking place in the reader's mind. 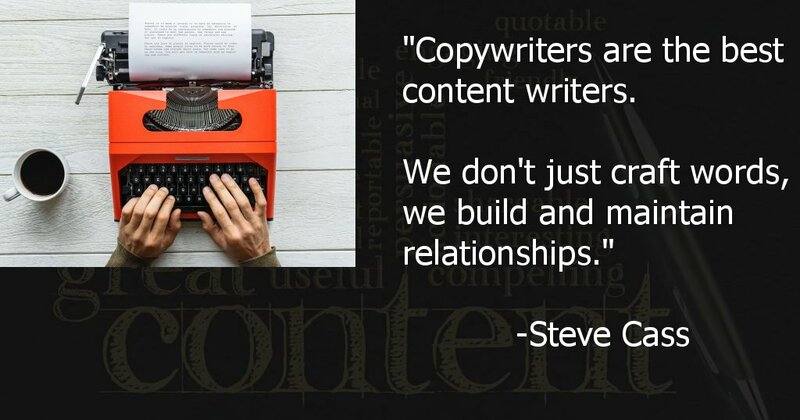 This is why copywriters are best equipped as content creators, website auditors, website architects, and online marketing consultants. Copywriters can be the best business partners you've ever had. Genius copywriters in American history ─ Ben Franklin, Richard Viguerie, Morris Dees ─ wrote free and valuable content to attract their audiences. Michelin, John Deere, Jell-o and Procter & Gamble knew that building their companies meant hiring copywriters. Their first priority was to conduct research to understand the challenges and needs of their target audiences. And then communicate that they understood those needs. With the internet and social media channels today, your company has an even greater opportunity to connect with your folks. You have the opportunity to change the world. Or at least to make your little corner of it a very bright place to be. The quote from Brian above sounds like he was listening to Ben Franklin and other successful content marketers before him. He knows that content marketing hasn't changed. Let our internet content be shaped with modern ideas, tempered with time-tested truths. Copywriters have always been content writers. No other type of writer is trained for persuasive marketing. We don't just craft words, we build and maintain relationships. What type of writer is best for company websites? What other ideas have you heard? Please let me know in the comments below.